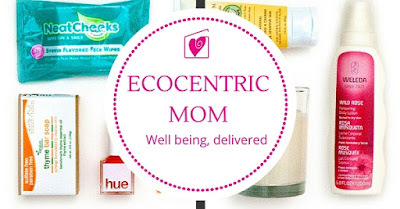 Recently I shared with you about the Ecocentric Mom Subscription Box. After sharing I received my first Mom and Baby box. The surprise of opening the box was fun. You never know what you will receive with a subscription box. I always like trying new mom and baby products. Love Child Organics Super Blends Pouch - This pouch was full size at 4oz. These are nutritionally focused organic foods and snacks for babies and young children. With no refined sugars, additives, preservatives, or fillers these pouches are perfect for babies meals or a young childs snack. Piyo Piyo Bendable Fork and Spoon Set - These are BPA and Phthalate free. This set is durable and perfect for baby to start self feeding. Piyo Piyo Pure Water Baby Wipes Travel Pack - They are made from purified water, plant extracts, and moisturizing agents. They are free from chlorine, alcohol, parabens, SLES, and dyes. These are great for diaper changes, feedings, and clean up. Acure Baby Fix-it Stick - This was a full size 0.5 oz stick. The Baby Fix-it stick helps to sooth 'ouchies', with the benefits of pumpkin, borage, and pomegranate oils. I'm keeping this in the diaper bag for anytime it might be needed. Lasting Smiles Organic Lip Balm - This came in full size. Made from pure and moisturizing ingredients. This lip balm will keep your lips feeling great and purchases help to fund cleft lip surgeries for children in need. ellovi Mint Chocolate Butter Minis - Made from six wildly harvested ingredients. It will soak in deep and keep your skin intensely hydrated and nourished for days. Enjoy Life Grab and Go Seeds and Fruit Mix - Gluten and allergen free, non-GMO verified. This snack is perfect for busy moms. This subscription box had a nice variety of items and even some full size products. I really like being introduced to products I have not tried before. There are 3 different options when purchsing an Ecocentric Mom Subscription. You can get a pregnancy box, mom and baby, or mom box. Every month there are different products to try and enjoy. You can choose to get a bi-monthly, single month, 3 months, 6 months, or 12 month subscription. New subscribers will receive a 3 month subscription for $50 using code USFamily! I was provided the above mentioned product in exchange for this post. All thoughts and opinions are my own and not influenced.